Queues are used to route callers to a group of agents. Callers who are routed to a queue will wait on hold for an agent to answer based on a series of rules you define in the queue settings. Queues are very flexible, highly customizable routing tools. At a minimum, a queue must have at least one agent assigned and must be connected to any feature that can route calls to a queue. Callers can be routed to a queue from a tracking number, other queues, voice menu options, smart routers, FormReactor submissions, auto dialers, or no-answer routing rules on a receiving number. 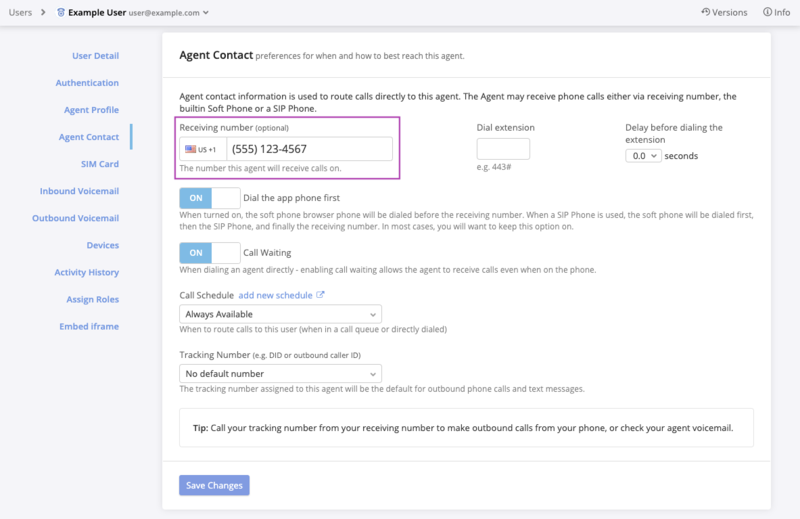 For the purposes of creating and using call queues, an agent is a user in your CallTrackingMetrics account. Agents can be assigned to multiple queues in your account, and their availability can be determined by schedules assigned to their profiles. You can configure many options in a call queue without assigning agents, but the queue will not work unless there is at least one agent assigned to the queue. To add an agent to your account, follow these instructions for adding a user to CTM. Although there is a user role named “agent,” any user can be used as an agent in a call queue. Each individual agent can choose how they prefer to answer the phone (by using the CTM softphone or by using their own receiving number). To allow an agent to receive calls without using the CTM softphone, you will need to add a receiving number to their profile (when creating or editing a user, enter this number in the Receiving number field in the Agent Contact section of the page). This section will walk you through the bare minimum setup required to have a working queue. If you wish to configure other options for your queue, refer to the additional information after this section once your initial queue is saved. All of these options can be changed or customized as needed after basic setup is completed. Navigate to Numbers → Queues. If you do not already have a queue in your account, you will be directed to a new queue settings page. Otherwise, click New Queue in the upper right corner. Enter a name and description for the queue. If you plan to use multiple queues, a good description is a helpful way to remind yourself what each queue does. Click or scroll to the Agents section of the page and click Edit Assigned Agents. In the pop-up that appears, click the names of agents in the list on the left to move them to the list on the right. Agents listed on the right side are assigned to this queue. Note: If you want to route to this queue by another method (other than a tracking number), you can stop here. Once the queue has been configured and saved, you can select it as a routing option from any other routing feature (other queues, voice menu options, smart routers, FormReactor submissions, auto dialers, or no-answer routing rules on a receiving number). With these basic settings in place, the last thing you need in order to use the queue is a way to route callers to it. 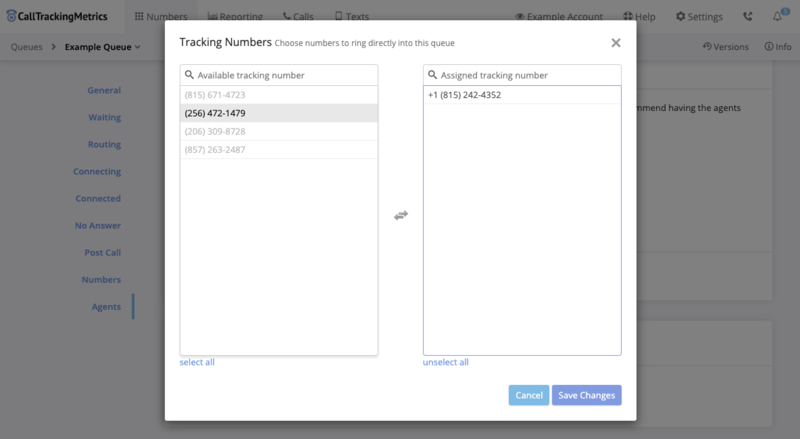 The simplest way to route calls to a queue is directly through a tracking number. Click or scroll to the Numbers section of the page and click Edit Assigned Tracking Numbers. In the pop-up that appears, click the tracking numbers in the list on the left to move them to the list on the right. Tracking numbers listed on the right side will route calls directly to this queue. The Routing section offers a number of settings you can use to determine how calls are distributed to the agents assigned to the queue, when the queue is available, and what to do when the queue is not available. For more details on queue routing, see the full article here. The Connecting and Connected sections give options for handling how agents are connected to calls for this queue, including agent prompts, connection beeps, and hangup settings. For more details on queue connection options, see the full article here. The options in the No Answer section of queue settings determine what happens to calls that are not answered by the agents assigned to the queue. For more details on no answer routing, see the full article here. By default, when a caller is routed to a queue, they will hear the standard US ringback tone while waiting for a call to be answered by an agent. You can customize this experience by selecting a different audio file to play in place of the ringback tone or by adding waiting messages to the queue. For more details on ringback and waiting messages, see the full article here. For more information on agent routing rules, see the full article here. For more details on calls per second, see the full article here.